Strong, durable brass body made from extruded brass rod will fit all yokes made to CGA860 drawing specifications. Protective and attractive chrome finish. 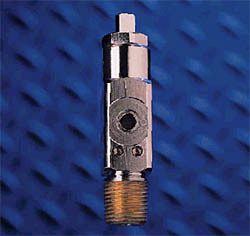 Internally threaded chamber design promotes longer life and helps protect valve body chamber threads from damage. Chamber design minimizes risk of broken stems caused by careless handling of cylinders. 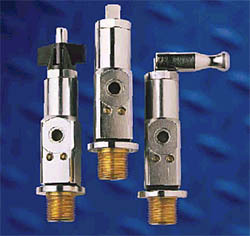 Single unit, compact pressure relief resists tampering. Nickel 201 rupture disc resists premature rupture that may be caused by corrosion from ambient environments. Large wrench flats on bonnet for easy removal. Precise, quality machining results in exceptional finishes for low torque sealing and long packing life. Inert Teflon packing provides leak-free stem seal, long cycle life and resistance to corrosion. Secondary O-Ring seal located above Teflon packing helps provide secure seal under vacuum purging and low pressure operation. Copper sealing gasket provides permanent, leak-resistant bonnet seal.